CH2M HILL was contracted by the Australian Department of Defence to perform an investigation and assessment of residual explosives capable of creating a personnel hazard within select buildings and utilities. CH2M HILL’s investigation identified approximately 12 kilograms (kgs) of aged TNT in a 150 millimetre (mm) diameter, 2.6 meter (m) pipe beneath the northwest corner of one of the site buildings. CH2M HILL needed to immediately eliminate the explosive hazard from the pipe. The test site is a former military munitions production plant and has been encroached by urban development. MuniRem Environmental was approached by CH2M HILL to provide MuniRem for use to remove the explosive hazard. MuniRem Environmental reviewed site assessment data and photos provided by CH2M HILL’s UXO personnel. MuniRem Environmental custom formulated MuniRem® reagent and shipped to the project site. An exclusion arc of 500 meters was set-up around the worksite. CH2M HILL and MuniRem Environmental personnel prepared MuniRem solution and used to flush the pipe. After many flushes, the discharge end of the pipe was capped, and MuniRem® poured into the pipe from inside the building, allowing it to pool up inside the pipe, keeping it in contact with the residual explosives. Once the pipe was filled with MuniRem®, it was left alone for 18 hours. 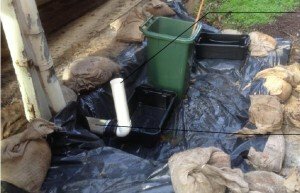 The next day the MuniRem solution was removed and the pipe was flushed a few more times. A camera was inserted into the pipe to confirm complete destruction of the TNT chunks. All of the flushing MuniRem solution was collected in three 220 liter drums. 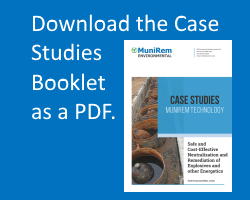 Residual explosives in the wastewater was treated by adding MuniRem® powder to the wastewater. 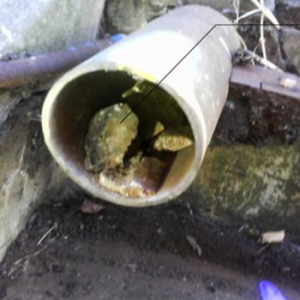 Visual and videos obtained by the camera inserted into the pipe confirmed that MuniRem® achieved the cleanup goal in the <48 hrs after application, which was reconfirmed by Analytical Laboratory analysis for explosives and MuniRem degradation products. MuniRem® was effective in the neutralization of the aged TNT that had accumulated inside the pipe for many years. The project goals were achieved without interrupting the activities of other contractors performing work on-site and the inhabitants in nearby residents.